If there was one thing I learned while I was house-sitting this month, it was that I really wasn't all that prepared to live on my own. For instance, did you know that if you don't rinse dishes properly, there's a high likelihood that you will end up drinking dish soap? Or that you can't put sausages in the fridge for a few days, then freeze them, then defrost and eat them, even if they're gourmet? Enter Adulting, the new bible to my maturity. 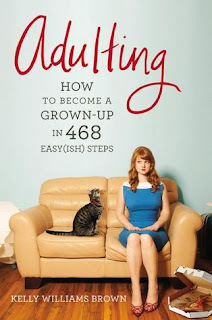 Based on the hit blog, Kelly Williams Brown's book is at once a meditation on lessons learned whilst growing up, and a survival guide for the newly graduated, the job seeking, the freshly moved out and the just plain grown up. It is the kind of book that makes the perfect gift. At once practical and hilarious, the book contains such highlights as: how to have indoor plants and not kill them, the Seven Dwarves of Toxic Friendships, and the sage advice to pair housework and Hip Hop music. I did not once feel as if the book were talking down to me. The author writes in a voice that is like that of a tough but fair friend. While not all of the advice is strictly gospel- for example, some things definitely have more to do with the American way of life- it is all worth thinking about, and I have found myself applying Kelly's guide to talking to new people at parties more than once already since reading it. I also immensely enjoyed the original illustrations and diagrams peppered throughout. Really, this is a book that sells itself, so please check it out if you get the chance.